Bringing social commerce to Facebook is a big opportunity attracting a lot of capital these days. Social swap meet Yardsellr just raised a $5 million series A financing, led by Accel Partners. Harrison Metal Capital, which previously put up $750,000 in seed funding, also participated. Yardsellr is an eBay for Facebook, except without the auctions. In fact, the company was founded by three former eBay executives, CEO Daniel Leffel (a former manager at eBay), VP of Marketing Jed Clevenger (who used to run the paid search team at eBay), and VP of Community Rachel Makool (who used to run the community team at eBay). Investor Michael Dearing of Harrison Metal is also a former SVP of eBay.com. Yardsellr is currently run out of the Harrison Metal office in Palo Alto. Sellers list items at fixed prices in different categories, or “blocks.” such as guitars, legos, jewelry, purses. Generally these are items people love and tend to talk about fanatically. Buyers can also follow blocks on Twitter, but most of the action is on Facebook. Yardsellr appeals to women in their thirties, which is not a strong demographic for Twitter. 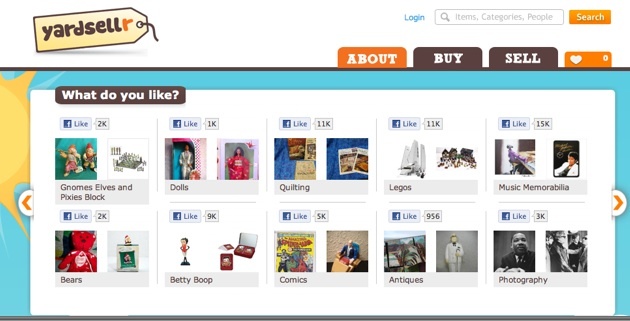 Buyers can get a steady stream of new items within any category by liking a block. This functions as an opt-in social marketing stream right in people’s feeds. “Facebook has one product essentially, which is that stream,” says Leffel. “You can’t be social commerce without living fundamentally in it.” The service launched in January, but didn’t really get a big push until April. All told, 1.3 million people are following Yardsellr blocks. About 100,000 or actively comment on the items in their feed, and thousands of transactions have occurred, with that number starting to ramp up every month. Although Leffel wouldn’t go into details, a back-of-the-envelope calculation puts the value of goods bought and sold over Yardsellr is in the tens of thousands of dollars to low hundreds of thousands of dollars. Instead of charging sellers to list fees, as eBay does, Yardsellr charges the buyers a fee of around ten percent. Yardsellr competes with Oodle, which is runs the official classifieds app for Facebook.